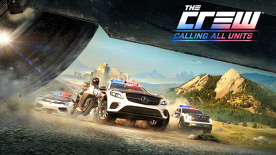 The Crew Calling All Units (DLC), which will include an extension for the base game The Crew, and also a free unlimited access to The Crew Wild Run (DLC). Street racers have been ruling the roost up until today. Want to set the record straight? Join the Police and chase them all across the US in frantic, high-risk pursuits. Multiply successful arrests and get your hands on a wide range of exclusive Cop vehicles - from exotic supercars to legendary motorbikes or indestructible SUVs. You’d rather stay in the shadows as an Underground Racer? Take off with the cargo and you’re in for some sweet rides and rewards. No place is off-limits and no chase is like any other, so whatever the side you’re on and whoever’s on your team, make sure you’ve got the right wheels for the terrain and use every special ability to boost your vehicle or sabotage your rival’s – no holding back! Get behind the wheel of the fastest, most iconic vehicles: from the swiftest supercars to the heaviest off-roaders, complete with Police paint job and light bar – that’s what you’re taking out on patrol. Don’t expect it to be a quiet one, though… As for troublemakers, they’ll get their share of new exclusive vehicles as well, fully customizable. In true Ivory Tower games fashion, all The Crew players can take part in this perpetual face-off, as Racers. They have access to special abilities like a blinding flashbang or temporary unlimited nitro, as well as the new level cap (60) and the matching performance boost. Note to all the Cops out there: more than 8 million Racers have been spotted in The Crew so far – time to put an end to their reckless driving! This DLC requires the base game The Crew on Uplay to redeem.